It is more important than ever before to have a presence online, whether for your business or personal brand. As entrepreneurs it is critical to have a “home base” to operate from. Many people use Facebook as their “home base”, but it is extremely risky. Facebook, or any other social media site, can change their algorithm or ban you from the site at any time if they choose to do so. Which means that you are not in control of the content that you publish on social media. Having a website that you control and own is extremely important. So how do you build a website? There are a number of great web development companies that can build custom websites for you, but they can be rather expensive and I would not recommend this if you are just starting out with your first site. There are also website builders that have template sites you can purchase, such as wix.com, but these type of sites many times result in sites that look similar to others and are limited in what they can do. I believe that using a self-hosted website run on WordPress is the way to go! It gives you the most flexibility, as well as the greatest potential power of any of the forms of website development. In fact many of the top websites you will find yourself on are run on the WordPress framework. So what does it take to build a WordPress site? There are a number of steps that are involved in getting a WordPress site up and running, but you an complete all of them in 30 minutes or less. It is very simple. Just follow the steps below. This may be the first step in the process, but it is also where many people get stuck. While the name of your website may seem like a huge deal, the name itself really doesn’t matter all that much. Just pick a name and go with it. The web address that you choose needs to be one that shows people what your brand is about. It is best if it can be the name of your business, or in the case of a personal brand it should be your name. However, if you are unable to purchase your business’s name, or your name, try to come up with a domain name that is either descriptive, or at least unique. Shoot for getting a “.com” domain name. It is by far the most common, and especially in the case of a business website it is the most professional and accepted type of domain name. Others such as “.net” and “.co” are becoming more popular, but “.com” is still the best. Reliability. Bluehost boasts that they have an average up time of 99.9% which is almost perfect. You won’t find any hosting service with better reliability. Support. Bluest offers great support, 24/7, including the ability to chat with customer service through an online chat. This makes receiving service extremely easy and quick. They also offer their 24/7 support via phone and email as well, so you can reach them however you prefer. Affordability. 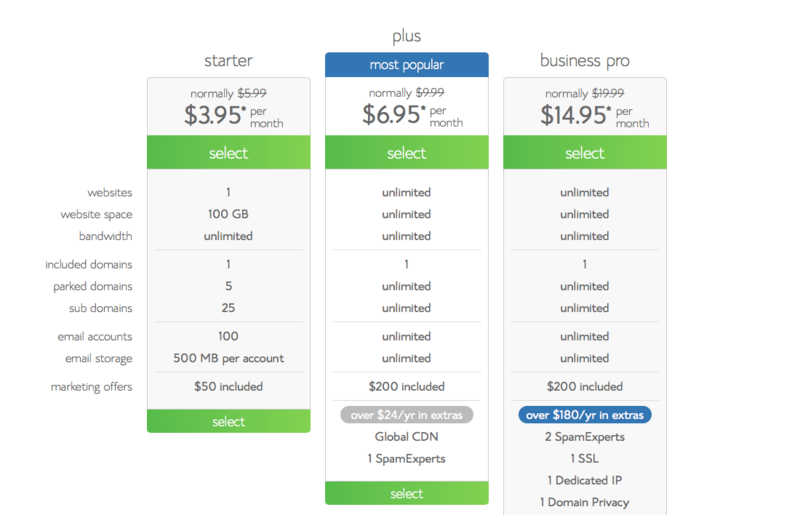 Bluehost is inexpensive, depending on the plan you choose they range from $3.95 to $14.95 per month. I recommend the plus plan, which is the plan I use. It offers unlimited websites, unlimited website space, and unlimited bandwidth. It also comes with 1 domain. WordPress Integration. WordPress only recommends 3 hosting services, Bluehost being one of them. 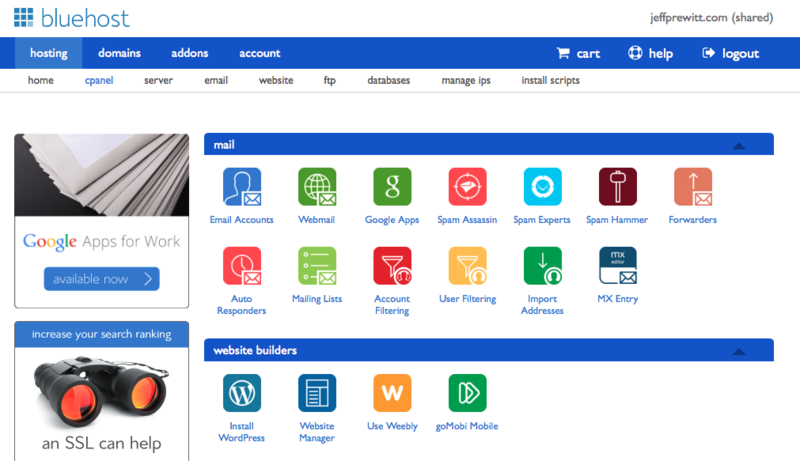 They also make it easy to install WordPress from your Bluehost cpanel, with a one click WordPress install button. To get started click here, and then click the “Get Started Now” button. Next you will have to choose a plan. The plan prices shown are per month but you will have to pay for the year all at once. You can also pay for more than one year at a time if you would like even more of a discount. Next you will select whether to create a new domain name, or to use an existing domain that you already own. 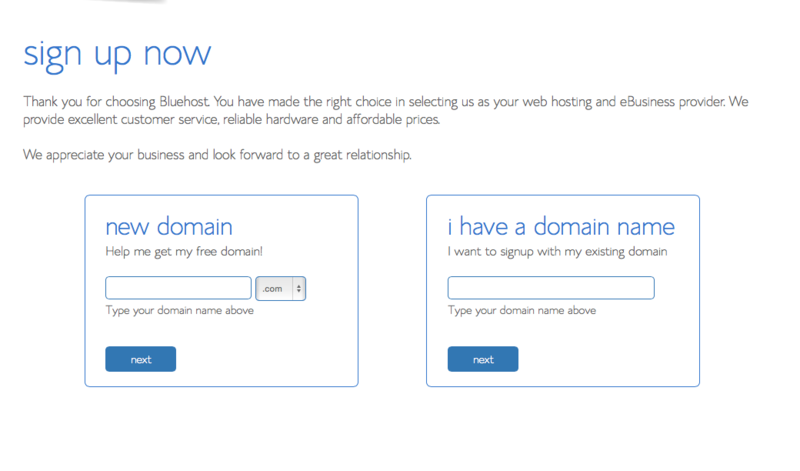 When you purchase your domain name though Bluehost they automatically connect it to your hosting plan. If you choose to go through another registrar you will have to change the DNS settings in to point the name servers to Bluehost. It is not hard, and there are many videos on Youtube that can walk you through the process, but I like to keep it as simile as possible by just allowing Bluehost to do all the work for me. Pick the option that is right for you and input the domain name you want to create, or the domain name you already own, and click the next button. Bluehost will then walk you through the rest of the hosting setup process. Disclosure: I am a Bluehost affiliate. This means that Bluehost pays me a commission if you use my link to sign up for a hosting plan. I only recommend Bluehost, and am an affiliate for them, because I believe in and personally use their service. I believe that it is the best hosting service available. Once you have created your hosting plan, and connected your domain name, the next thing you will want to do is create an email address for your website. 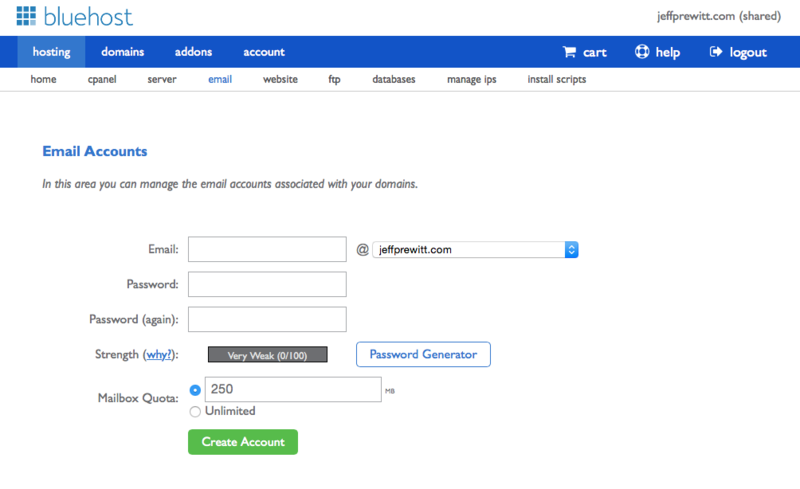 You can do this by signing in to your Bluehost account, and going to the cpanel link in the top navigation. Next you will go to “mail” section and and click on the “Email Accounts” button. It is the first icon in the “mail” section. It will take you to a screen where you can choose the name of the email address, as well as the domain you want to connect it to (only if you have more than one domain connected to your account). So if you want to have an email address that is [email protected] you would just enter you first name into the field before the @ symbol and then make sure your domain name is showing after the @ symbol. It will also require you to create a password, and enter it a second time to verify it. The last step is to choose the max quota for space for your mailbox. The default setting is 250mb but you can change that number, or choose unlimited if you would like more space. Then you can click create account and you are done with setting up your email address. Once you have hosting, a domain, and a email address it is time to get the site up and running. I use WordPress for all my websites. It is one of the best tool out there to create and manage sites on, and it is free! Even better, Bluehost makes it super easy to install WordPress on your site. They have a “website builders” section on the cpanel, where you can find a “Install WordPress” icon. Click that and let them walk you through the process of installing WordPress on your site. Once you have installed WordPress it is time to log in to your site. To do so go to http://www.yourdomain.com/wp-admin/ (replace yourdomain.com with the domain name you chose). You will enter the user name and password that you created during the WordPress install to login. By default WordPress activates one of their free themes for your website. However, if you would like to customize it (which I recommend) you can go to Appearance > Themes on the left side menu once inside WordPress and choose new theme, or upload one you have purchased. I use a theme from Themeforest.net, but there are tons of great sites where you can purchase themes from. Some of the best I have found are Themeforest.net, Studiopress.com, and DIYThemes.com. There are also tons of free themes available through WordPress, as well as other sites that you can use if you choose not to purchase a premium theme. I recommend that you choose a premium theme however, as they are not that expensive (the theme I use cost me $58), and they allow your site to stand out from the crowd a bit more once you have done a bit of customization. Disclosure: I am a Themeforest affiliate. This means that Themeforest pays me a commission if you use my link to purchase a theme. I only recommend Themeforest, and am an affiliate for them, because I personally their products. Note: Some people don’t like to have their site visible to the rest of the world while they work on getting it set up, and getting content created for it. If you feel the same way you could install a “coming soon” type plugin so that there is a coming soon page visible while you work on the rest of the rest of your site. I have used a plugin from SeedProd before for this and it has worked well. Once you have chosen your theme, and have uploaded it to your WordPress site, it is time to customize the look and feel of it. This can take a short amount of time, or a very long amount of time depending on the theme you choose and your desired level of customization. However, in just a few minutes you can change the colors and add a logo (if you have one) to give your website a more personalized feel. Congratulations you now have a website up and running! You are now ready to begin creating content to put on your website. No matter what type of site you are building, whether a personal blog or a business site, you now have the framework all set up to begin adding content and connecting with people on the web. It doesn’t take long to get going, getting your site set up was the quick part. Now you have to figure out what type of content, and how much content, your site needs to have to best serve your intended visitor. It can range from a very simple blog setup, to a more complex business site with many individual pages. Its up to you. Look around at other sites that you like to use, and see the way they are set up. At minimum you will want your home page (for a blog you will use this for your recent posts), an about page, and most likely a contact page. Any additional pages are up to you. The most important thing in the process of creating a website is to enjoy it. You may be taking on something completely new here, and that is exciting! Question: What questions do you have about setting up a website? Comment below or join the conversation on Facebook or Twitter!